I picked up a couple hay trolleys, a Leader brand cable model and a Ney that runs on a track. I had the Leader on a cable but i made up a steel pipe to display it on. A couple vids of them. The Leader on cable and the new pipe. The Ney on a track i made up in the house. A good web sight about them. A good video of them in action. Pretty cool buddy. You must have your own private museum out there! Thanks fellers, it must of been quite a improvement over pitching it by hand. The cable one was set up between two tri-pods and hay was unloaded off a wagon and put into a pile. I have hay fever just thinking about loading the loft! 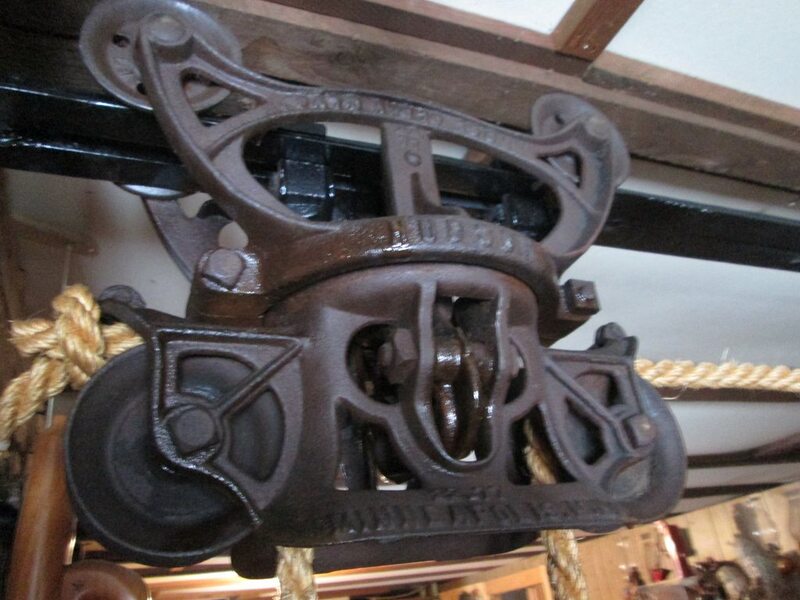 Good stuff , the ingenuity of our forefathers is cool to see. Had no idea these existed. Thanks, Pitch! There`s probably lots of them around in old barns but getting up too the peak of the roof to get it isn`t for this guy. There`s lots of cool vids on YouTube under hay trolleys. 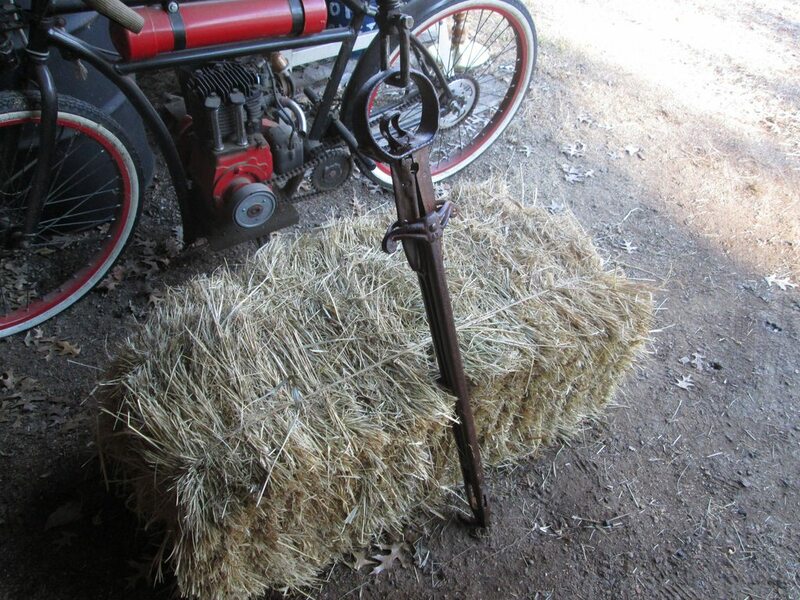 If we were still putting up hay and was younger i`d put one up in the barn and use it proper. I have 12 foot of track coming tomorrow i`ll probably put the Ney on if i`m up to it. I can remember them being used in some real high lofts. that was before the PTO driven elevators were used. Even with those things, bucking hay was not easy. One ford tractor dealership I worked in used a hay track as an overhead hoist track. 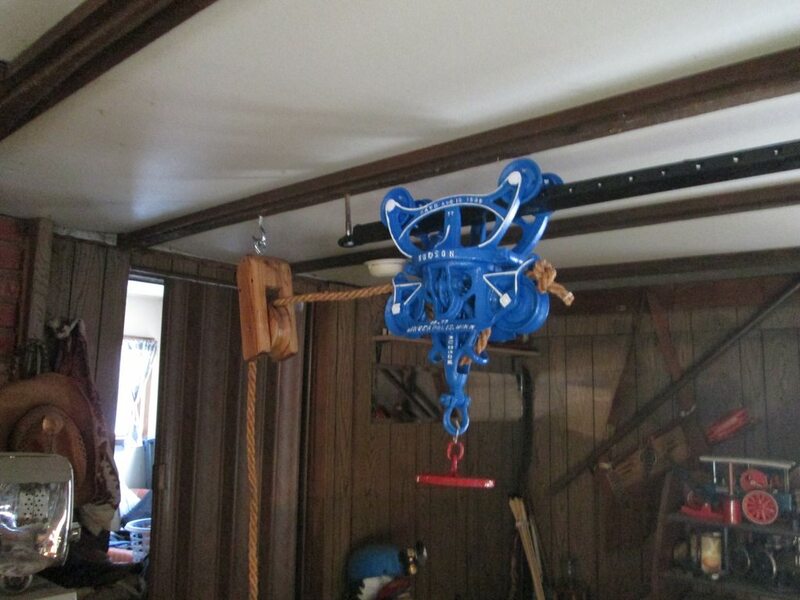 I lifted some very heavy loads with that hoist. It would handle a four cylinder Ford 7000 Diesel engine without problem. Eventually we broke a joist in the ceiling from lifting to much with it. Thanks piller and Chuck, say hows that cross bow coming along? That's really neat Lenn, thanks for sharing. It's interesting to see what our forefathers did to make their jobs easier. But then consider that someone had to conceive the idea, make a prototype, finalize the design, make castings and then make and sell it, ship it and install it -- and a whole lot of different efforts into getting one of those into a barn or out to a rural farm. And that was way before we had Amazon -- or PITCHY to do it for us. There was one of those up in the barn on my grandparents barn in Shelburne, VT. No idea what brand it was but it sure looked like that Leader you have, right down to the little "flippers" that opened into/under the hay. That one was on a track. They used it, with loose hay, for some time when they first bought the farm in 1946. No idea when they stopped but it was when they bought the first mobile baler in the area, a New Holland 76 with a canvas belt pickup. I can just barely remember that baler, I was born in '49 so I was probably 5-6 years old. That was NOT a machine they ever thought highly of! Thanks fellers, yep i think i read on Trolley heaven there was like 1,300 or more patents on the idea. Cool story Alan, yep the hay baler must of been a welcome invention also but lots of problems for a time. Got the new track today and we got it up. Pitch , I am doing a little each day on the crossbow. I finished the side plates for the nut/ trigger today. Still have a little fitting to do there. I am in no rush and won’t be able to do anything tomorrow. I am taking my 2013 Ford F-150 in for a recall. It seems there is a sensor that an cause the transmission to shift into low unexpectedly possibly causing loss of control. A computer update is supposed to prevent that from happening. Supposed to be done while I wait. Cool, hope ya post a thread on the build, looking forward to seeing it. Like being in a time machine.........It's about 88* at 2:00 in the afternoon in August here in Ohio . 1969.. I'm 15 ...After following the hay baler around for hours and pitching bales up on the truck, back to the barn......an electric hay elevator brings bale after bale of hay up in the barn, thrown off of the 1940's Studebaker flatbed, the layers of rectangular bales were separated only by a good layer of salt thrown on each one. the closer We got to the top of the barn the hotter it got and in the small window at the peak were the King Kong of ugly huge barn spiders . once filled to the top We made our way down the ladders all the way to the ground floor, to the water well, most of the wells were deep and the one at the big barn had water like ice water. nothing ever tasted so Good. I had a Great time as a Kid and was watched over by some wonderful people. Off in the other side of the barn was the Hay Trolley that sit silently on it's track with the giant fork that would never be used again . I often wondered about just how they worked. And now I know the rest of the story. Thank You. Pitchy. Cool story 45colt, yep haying was always hot, i remember one time when i was a kid we were putting square bales using a elevator in the second story of a old house through a window. The bats were flying around in there like flies and one landed on a friends ear, boy were we glad to get out of there. Trolleys, now ya know glad ya enjoyed the thread. 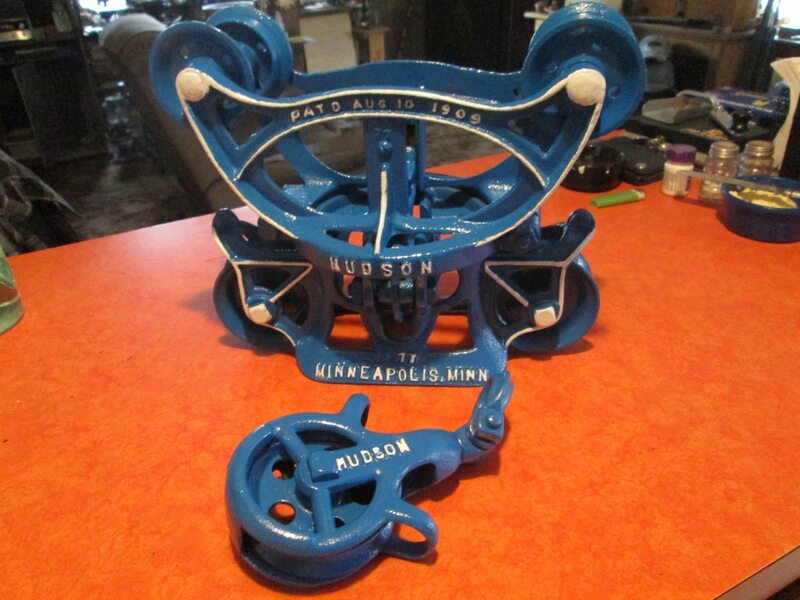 Got the Hudson trolley made in MPLS today, had to make a track for it but we got er done. Thanks Gunny yep they are real ornate. I believe this one originally was red with blue pulleys. but not positive will have to research some more. I learn more darn stuff reading Pitchy's threads! I`m learning right along with ya buddy. Thanks buddy, we just painted it waiting for it to dry then will post a picture, this model was all blue with white lettering the other models were red. Got er done, looks pretty good. Wow talk about eye candy! That looks great Lenn! Almost too pretty to use!! Now, you need to rig it to your archery target. That way you can shoot your crossbow, yank the trolley cord and get your arrows back without any walking! Now there`s a idea, thanks buddy. One more picture on the track, that`s it for hay trolleys. The red, white, and blue is indeed beautiful. Not many items are designed to last nowadays. Too bad. Thanks piller, my first thought was the flag, she caries a heavy load. Today we made a miniature wood hay harpoon. Cool. Being from the dry country of the high desert plains, we could store hay outside most of the time. These implements are new to me. I showed them to my Dad who grew up in the Cimarron Strip, and he had never seen these things. They stacked their hay outside. Thanks piller, the first video on my first post shows one in action on a square bale but they used them for loose hay also. They also made a single harpoon and i just bought one on ebay and will post it when it arrives. Pitchy I am late to the party again. I have one in my barn that came out the gable end until 15 years ago or so. I saved the track I took down. I also had a bow off the the side about 15 feet up the gable end barn wall. My dad knew what everything was and how to use it. ( There was one in the dairy barn at Grams folks) He said they pulled the wagon under the grappling and tripped it, then they took the line that ran through the hoop and used one of the team that was taken off the wagon and pulled it up and and back in the barn. My barn is 100 feet long so it must of been a great improvement. Dad said the kids would get to jump around on the hay to pack it down so more would fit. My tines are a scary item! Thanks for the videos. Thanks EdinCT, sounds like ya have some neat stuff and memories, would of been fun to put up hay that way at least for a while. I`m building a miniature barn and trolley today should have it done by tomorrow afternoon so watch for that. 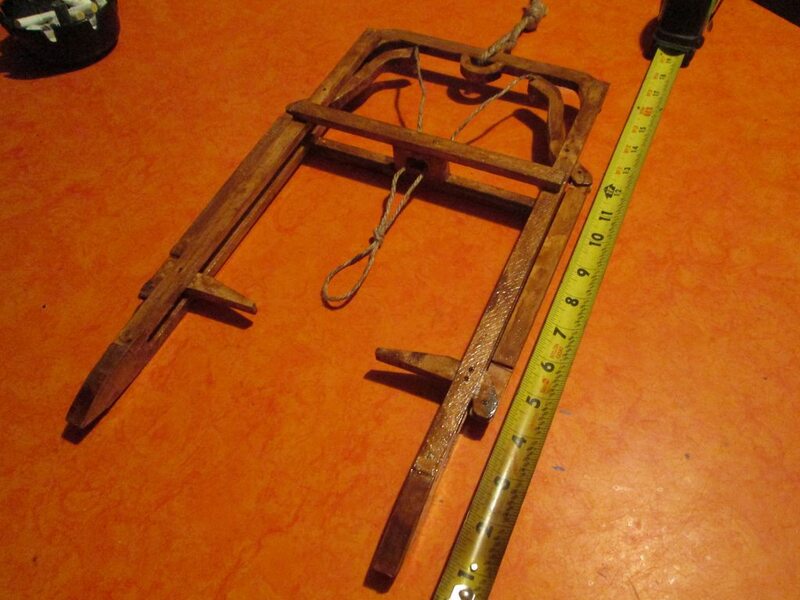 Got the single hay harpoon today, it dates to 1865. It was advertised to pick up 8 hay forks of hay. A string would run through a hole in the handle and tie too the trigger so it could be tripped from the ground. Got another hay harpoon, painted it to match the Husdon trolley. 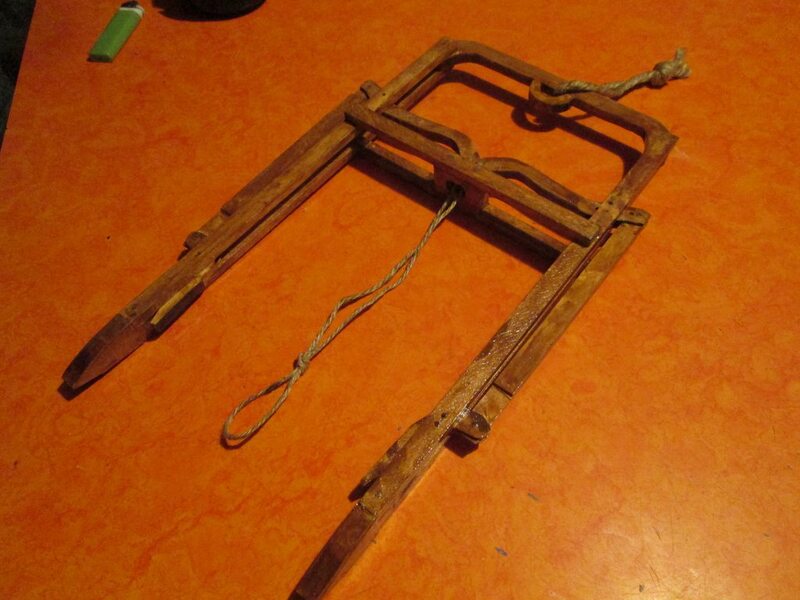 Double thanks buddy, with Jays help we found out it was made by the Milwaukee hay and tool Co.